I was playing this earlier today when it hit me that this is something I could blog about. Fantasy shares some similar tropes with Horror especially with its violence and monsters. Golden Axe is a side scrolling fighting game by Sega. 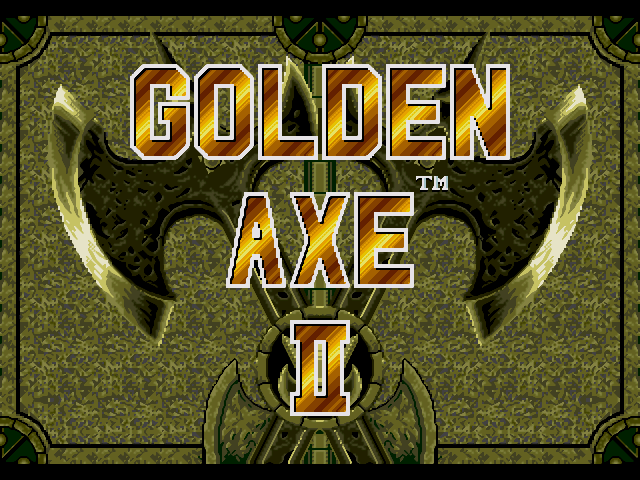 Golden Axe saw you playing as one of 3 characters; the Dwarf Gilius Thunderhead, the Barbarian Ax Battler and the Amazon Tyris Flare. 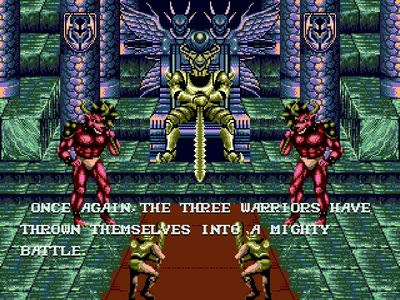 Golden Axe II again has you choose from one of these 3. Several years after the defeat of the conqueror Dark Guld he returns stronger than ever, once again seizing the throne and taking control of the Kingdom the game is set in. It is up to the 3 warriors to fight their way through 7 scrolling levels on their path to the Castle of Dark Guld. 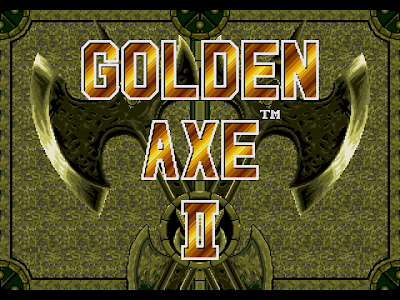 Golden Axe was a fun game but Golden Axe II is the real series highlight. Everything in the sequel just seems more bleak and desperate. The background music throughout the game is mournful and full of sorrow even when it has war drums thumping away. The locations you fight through are all dank and depressing; ruined villages, crumbling ruins, the grim fortress of Dark Guld, it seems like a land that has had its heart crushed. The last few levels see you assault Dark Gulds castle and it really feels like a dramatic place with enemies now decked out in golden armour. Eventually you fight to the throne room seen in the pre game story where you discover the being seated on the throne is not the real Dark Guld. You head to a beautiful palace where you fight the real Dark Guld to the beat of really inspiring music. 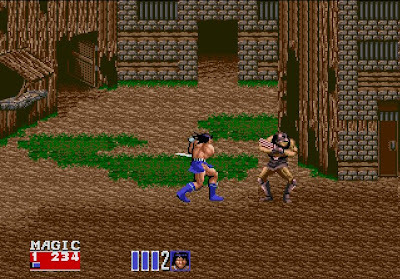 Much like Golden Axe civilians appear every now and again but whereas in Golden Axe they were likely to be running away here they are usually being beaten up by the enemy characters. The enemies are again a mixture of human types and monsters. The main enemy type of soldiers armed with claws and clubs but these are mixed up with a wide range of skeletons, lizard men, possessed suits of armour and Minotaurs. Bosses are quite cool, though the bosses all show up in later levels as normal enemies. Golden Axe saw you beating up defenceless thieves to get magic and health but in this one the thieves are replaced with mage's who fight back. The game is quite easy and due to the bad A.I many enemies commit suicide by walking off cliffs or into pits, despite this the game is fun. It is a scrolling fighter, quite basic so there is not much detail to go into. Remember that the Dwarf is the best pick as he is the strongest!